The Hampta Pass Trek takes the enthusiastic expeditors over the majestic foothills of the Himalaya, the Pir Panjal Range, crossing at Hampta Pass (4,268 m) to reach finally at the remote Lahaul. 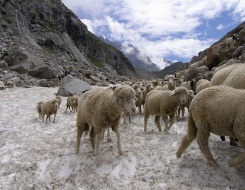 Lahaul is an isolated district of Himachal Pradesh lying grandly amongst the Himalaya peaks. It had been the traditional alternative route between Lahaul and Kullu Valley before the road was made over Rohtang Pass. The Hampta Pass trek takes one through the mighty fields of Oak, Rhodo, Pine and the Hampta River that stand on the either side of the Hampta Mountain. This stands as a bridge for the villagers of Hampta to the Lahaul Spiti valley. 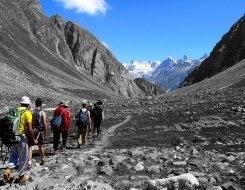 Trekking at Hampta pass ranges begins at Prini village and goes uphill to bringa change of landscapes on the way between the two valleys namely Lahaul and Kullu. The Lahaul Valley is full of sand and rocks and on the other hand the Kullu Valley is plush with fresh greenery all around its ranges. The natural beauty here takes a new shape every day and this is the reason the trekkers find themselves at a new place whenever they make their start. We drive to Prini and then from Prini we reach Pando Ropa, 4 hours trek which goes steeply along side of Hamta Nala through forest. Overnight in camp. 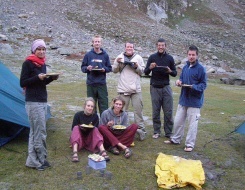 Gradual up trek passes through forest and meadow up to Chikka camp, and ideal site with water and firewood. Overnight in tents. We trek uphill, a steep climb, to Juara and then gradual climb up to the camp site at Balu Ka Gera. Overnight in tents. Steep ascent up to Hamta Pass for 3 kms and then descent on the other side in steep slope up to Camp Site. Mt. Deo Tibba and Indrasan are visible along with a wide view of the Lahaul Valley. On the 7th day of Hamta Pass Trek, we make a steep descent up to Chattru Camp site. Overnight in camp. The Hamta Pass Trek continues and we reach Solang from Chattru. Overnight in camp. In the morning after breakfast drive to Manali and visit Hadimba Devi temple, old Manali and Vashisth Village (hot water spring). In the evening drive to Delhi by AC Volvo coach Overnight journey.